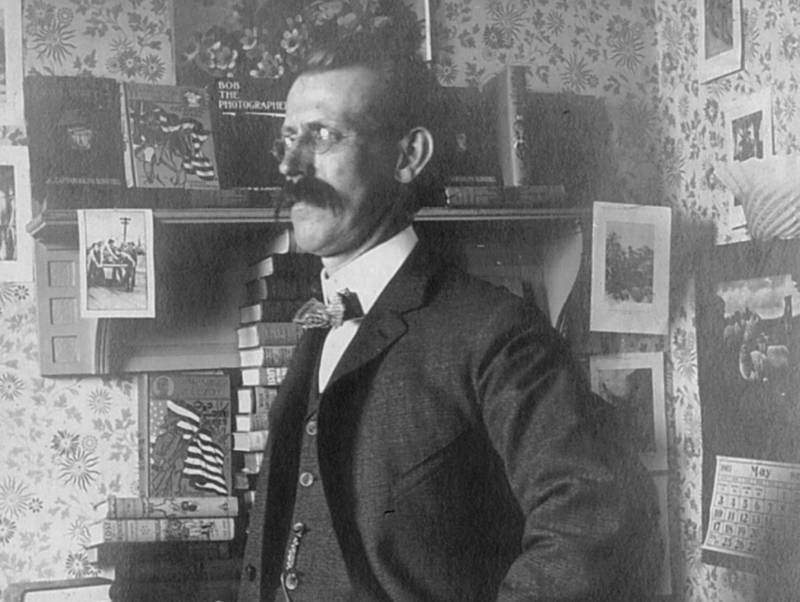 Happy Birthday to our Favorite Children’s Book Serialist… Mr. Edward L. Stratemeyer! On October 4th, 1862, a children’s literature tycoon was born. With his humble beginnings, of course, no one ever would have suspected that a talented writer and publisher was in their midst. Stratemeyer was born the youngest of six children in Elizabeth, New Jersey to a young tobacconist and his wife. Both of Edward’s parents had immigrated from Hanover, Germany in 1837, and yet Stratemeyer’s main language was English growing up. As a child, Stratemeyer read Horatio Alger often, enjoying his rags-to-riches tales immensely. He later was said to have remarked on how much Alger’s stories influenced him as a young man, and gave him some of the confidence he later used to begin his career. It looks as though even as a teenager Stratemeyer had some idea of what he wanted to do as an adult, as he opened his own amateur printing press in the basement of his father’s tobacco store. He printed local & homemade flyers and pamphlets, and a few short stories such as The Newsboy’s Adventure and The Tale of a Lumberman. After graduating high school, Stratemeyer worked daily in his father’s shop, and kept up printing a few items here and there. It wasn’t until he turned 26 that he sold his first story to popular children’s periodical Golden Days, and received $76 for his contribution (a fact that the helpful internet informs us was over six times the average weekly paycheck for the average US citizen at the time). After experiencing this hint of fame and riches, the young writer moved to the larger city of Newark (NJ) and opened a paper shop. He continued to write while earning his daily bread, and penned stories in many different genre’s – short westerns, serials for New England periodicals, dime novels, detective fiction… you name it, he wrote it (well, perhaps except for romances. But I digress). In 1893, just three short years after moving to Newark, Stratemeyer was hired by well-known dime-novel author Gilbert Patten to write for the Street & Smith periodical popular with young boys & men at the time, Good News. Stratemeyer was a popular editor & author at the magazine. Just a year later in 1894, Stratemeyer began publishing some of his stories as hardcover novels, the first of which being Richard Dare’s Venture – part of the Bound to Succeed series. Though his first four novels sold reasonably well, the publisher of the stories, Merriam, was unable to publish any further stories due to an economic depression that struck the United States in the late 1890s. Stratemeyer wouldn’t be sad for long, however, as shortly thereafter publisher W. L. Allison picked up his books and published twelve of his titles, and in 1899 an amazing thing happened to young Stratemeyer… he was asked to finish writing for two of his childhood heroes! First Stratemeyer was asked by Lee & Shepard to pen the last book in a series begun by “Oliver Optic”, of William T. Adams. Adams had passed away before being able to complete the series, and the fans were left with baited breath. Around the same time, author Horatio Alger’s health was declining and he was also unable to finish his writings. Stratemeyer began work on Alger’s stories shortly before Alger’s death in 1899. Alger’s sister Olive negotiated with Stratemeyer to complete some of Alger’s stories that remained as notes or early chapters but that were never finished, and publish them under Alger’s name. 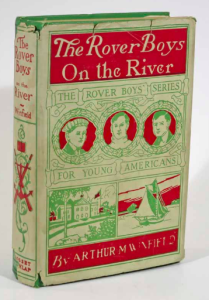 The first popular series that Stratemeyer wrote was known as The Rover Boys – an instant success and a series that achieved immense popularity. Stratemeyer is even said to have mentioned that this series was his favorite throughout the years of authorship and publication! In 1905, just a few short years later, Stratemeyer formed the Stratemeyer Literary Syndicate and began hiring journalists and other writers to pen stories based on his plot ideas. Stratemeyer paid each author a flat rate for the books they submitted, and then kept all of the copyrights to the novels themselves. The journalists wrote under pen names, which also allowed different authors to publish books in the same series. In this vein, printer, author and publisher Stratemeyer was now acting as a “literary agent” for ghostwriters in a way. Through the Syndicate, Stratemeyer would be the imagination behind quite a few immensely popular series books, including the Tom Swift series, the Bobbsey Twins, the Hardy Boys, and the Nancy Drew books. Though there are many more titles and series under the Syndicate’s name, these are the most well-remembered today. After Stratemeyer’s death in 1930 at the age of 67, the ownership of the Syndicate was passed on to his two daughters, Harriet and Edna. At first, the sisters thought to sell the Syndicate, but quickly realized that they preferred to keep their father’s business alive. They went on the keep the Syndicate running for twelve years together, and then Harriet kept the Syndicate together until her death in 1982. Today, Edward Stratemeyer’s books are largely considered some of the most beloved and well-known children’s series books in the business. They certainly opened a door for series books, and gave many authors the ability to write a be published (even if it wasn’t under their name and they had no rights to their work… but regardless). Happy Birthday to Edward L. Stratemeyer! This entry was posted in Antiquarian Books, Children's Books, Collecting, History, Uncategorized on October 3, 2016 by tavistock_books.